Good relaxing listening. Penelope Keith brings the story to life with her wonderful narration. Great. When you can't sleep at night or on a long journey nothing bette to listen too. WithPenelope Keith reading , she has such an lovely voice to hear. Agatha Raisin, another good story. Keeps you guessing until the very end. The gruff heroine sorting her hap hazard life out but things never go as straight forward as she would like. If you can stomach the Tory-party-manifesto monologues from the character Charles then you will enjoy it. I struggle with it but still enjoyed the plot and Raisin as a character. What's not to love! Easy going, entertaining and captivating - a perfect listen! Looking forward to the next instalment. I do love an Agatha Raisin mystery. I love Agatha Raisin. She's competent, capable infuriating and deeply human. The mysteries can be a bit silly but that just adds to the charm. I always want to give James Lacey a clip around the ear and love the friendships she has snd how they illuminate her character. 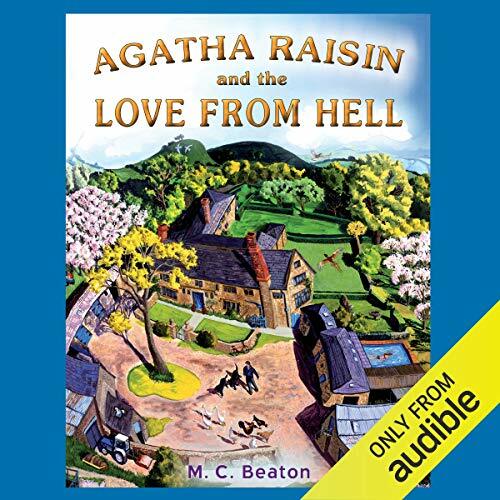 Sometimes the writing can be repetitive but some how that adds to the charm too (note ironic repetition) MC Beaton is altogether a very entertaining writer with a sharp eye for human frailty and Agatha Raisin, despite her faults, is my favourite of her characters. Just the job for a few days poorly in bed! PK reads excellently, with different accents and male voices . Having been Agatha in the fab Radio 4 dramatisations, she is THE Agatha for me , reading this unabridged book with aplomb. Will certainly be getting more. After all this trouble - the marriage doesn' t work. Kind of disappointing, but who could compete with God? Two stories in one seem a bit confusing, but Agatha ist working it all out. Will Charles become husban no.3? Sorry for the bad review for this book. I have been listening to the previous one but couldn't edit my review for the previous one. Not to be able to edit ones reviews is extremely odd. So what I wanted to add is that not only Scrabble is missing in the previous one, but that also James's father is in one of the previous books mentioned as Harry, and in one other as Robert. I love the series but more consistency would be less frustrating!!! !